Joe Bascetta, center, owner of long-time Hartford business Pelican Tattoo, with tattoo artists Brandon, left, and Pete, in front of the shop on Park Street. Photos by Shana Sureck. Joshua August tattooing at Pelican. Joe Bascetta likes to go with the flow. It’s what brought him from Hartford to the Bowery in New York City and back again; from fashion designer to tattoos and piercings. Today, you can’t miss his shop on Park Street in a building with a huge fluorescent mural, and a bright pink sign that reads, Pelican Tattoo. Bascetta’s original Pelican Footwear shop in the Bowery was all about fashion. Bascetta’s wife was a sculptor, and he was an artist. “We had this idea,” he said. “Maybe we could do a Carmen Miranda shoe, like really high.” His wife hand carved the original prototypes, which evolved into the platform shoe. The Village Voice did an article on them. They were featured in Life magazine and Vogue. 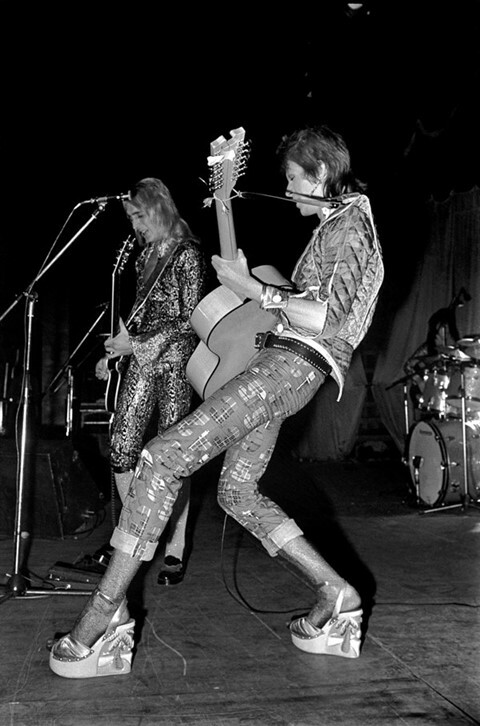 Within a few months, their shoes were on the feet of David Bowie as Ziggy Stardust at Radio City Music Hall, as well as Debbie Harry and the New York Dolls (David Johansen was the best man at Bascetta’s wedding). At the time, Pelican still primarily sold punk- and new wave-inspired clothes. But that wasn’t where the demand was. “I’m bringing in great fashions, and people are like, what’s that? '” Bascetta said. “It was really hard making a dollar in Hartford. In New York, I always did really well.” The business shifted to body art and piercing. “Eventually, it just took over, and the clothes got less and less,” he said. He went to New York to get trained, and his was the first licensed shop of its kind in the state. Listen to the full Radius episode on Park Street. Love Joe and Carole! They are what makes Hartford special. Love you Joe and Carole. Miss you both and the old Pelican days. Susan, your friend and former long time employee.